A vocal and continuous criticism of the church in our day, and most likely throughout the centuries, is its lack of relevance to contemporary life. It is commonly assumed by many that in significant ways the church is “behind the times.” While in certain ways this may be true, in the most significant matters it seems that this accusation is leveled by those who merely don’t like what the church says on certain matters. This is the case especially in matters of morality and reliance upon a Savior who two-thousand years ago was crucified on a Roman cross. Of what relevance does a violent death two-thousand years ago have on us in these civilized and progressive times? Indeed we have advanced, but we must ask the question as to what end we are advancing – toward a life-filled paradise or a death-filled wilderness? When one encounters the criticism of the church being “behind the times,” it usually comes out of a disputed definition of what “paradise” is. Our culture has bought wholesale that “paradise” is defined by us, not God. Indeed, the Bible’s definition of paradise, as that of living in full fellowship with God and in full obedience to him on his terms, is in conflict with our view. Many might like the idea of living with a god in paradise, but it is on our terms, and this god becomes obedient to us rather than vice versa. This struggle over paradise is not new. It is the tragic human story. The lie that Adam and Eve bought was that they could be with the times and that God was behind the times. They sought progress and advancement in their knowledge and experience – a greater paradise. Instead they inherited the wilderness. So, in response to the criticisms of the church being “behind the times,” the church with boldness and humility responds, “We are a people ahead of the times.” This bold claim is not made from our own strength, as if this is an even-matched arm wrestling with the opposition. 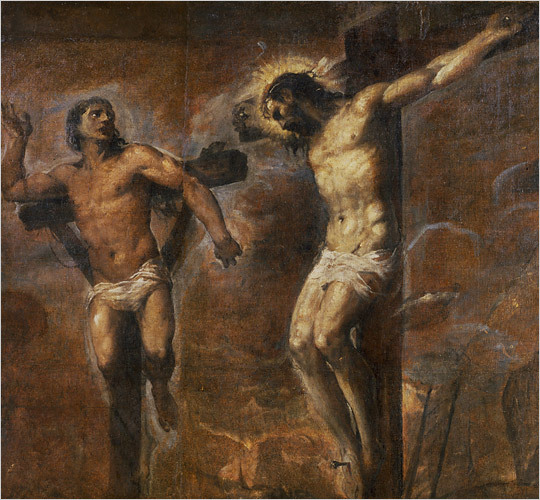 It is made from our weakness and reliance upon our crucified, risen, and ascended Lord – Jesus Christ, who has overcome the world. “In the world and in our hearts, his sovereignty will continue to be disputed. We are a people who say now, who say ahead of time, what one day will be said by all. The Church, the community of faith, is the people ahead of time” (p. 39). We speak and proclaim what has been promised, the promise that Jesus speaks to all sinners who believe, the words he spoke to the thief on the cross beside him, “Truly, I say to you, today you will be with me in paradise.” But this is God’s paradise that he gifts to us, not our self-defined paradises that we assume God would be glad to enter. The church proclaims what has been promised and it progresses through faith, “being sure of what we hope for and certain of what we do not see” (Hebrews 11.1). As Neuhaus says further, “It is by faith that we follow this disputed sovereign, this crucified king who speaks of paradise when all we see is paradise lost” (p. 39).